Work. It’s occupied my thinking and my writing for a long time. Disillusionment with my work as a nurse, work I had seen as a calling, spurred me to a family sabbatical in 1994. Photographs of hands engaged in work inspired me to put into words the satisfaction that can come with manual labor and resulted in my first book, Hands at Work. Now, as I write my memoir, I’m uncovering even more about the meaning of work in my spiritual journey. 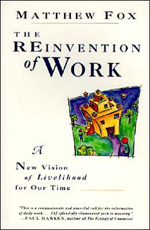 In his book, Fox, a theologian and Episcopal priest, considered that we were in a radical and creative moment to redefine work itself. I believe we still are. Fox recounted the impact of the historical shifts of the agricultural revolution and the industrial revolution, shifts that pushed us to focus on productivity and consumption. He called readers to attend to our inner work, “…that large world within our souls or selves,” in order to change the ways we define, compensate, and create work. Health care was one of the areas of work that Fox believed needed reinventing, and I couldn’t have agreed more. Even though my nursing education in the 1970s and 80s acknowledged the connections between mind, body, and spirit, I worked in systems shaped by the industrial revolution’s emphasis on technology and its view of the body as a machine. Five years into my nursing career, I witnessed the beginnings of health care becoming privatized and for-profit. This shift wasn’t doing anything to assure access to health care, and public health seemed the safety net best equipped to catch those who would fall through the inevitable cracks. I viewed public health nursing as a way to promote justice, especially for the poor and underserved, and I embraced it. Eventually, public health, too, was undermined by the breakdown of the entire health care system. I’d broken down, too, from not attending to my inner work. So, in 1994, instead of just vacationing in Stehekin, my family and I moved there. My husband and children welcomed the adventure of living in a community to which no roads led, just a ferry stop at the end of 55-mile long Lake Chelan; the wonder of bear cubs digging for grubs outside the cabin; the drama of being at the mercy of a finicky hydroelectric plant, a river flooding its banks, and forest fires. I embraced adventure, too, but even more, I sought escape. In Stehekin, there would be no newspapers, radio, or TV newscasts to link me to the rest of the world. No phone service for updates about families I had worked with or the latest communicable disease outbreak. And no doctor or public health clinic. I took a job kneading dough into loaves at the local bakery. I also delved into Fox’s book and filled the blank pages of four journals with questions about what work I was called to do. Nearly twenty years after first reading Fox’s vision that “…work is an expression of the Spirit at work in the world through us,” I continue to experiment with my own vision. I have gotten clear that writing is at least a part of it. So, each day, I light a candle, grasp a pen or place my fingers on the keyboard, and go to work.